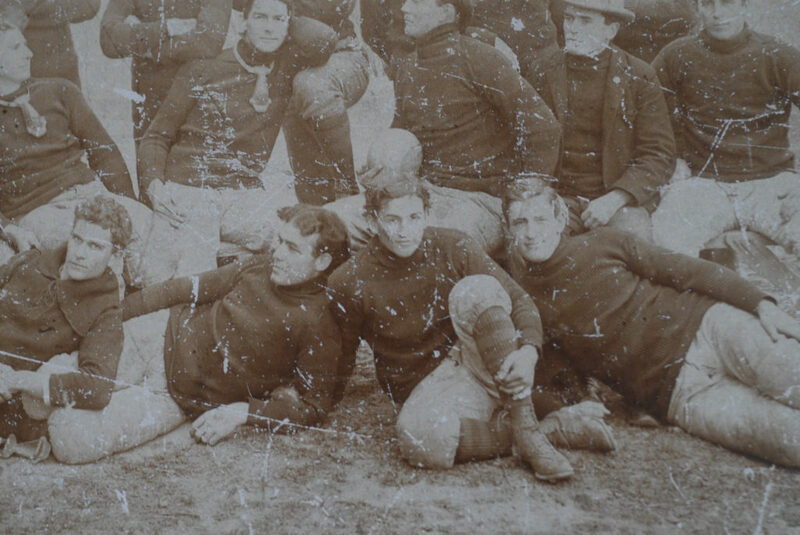 A quarterback on the 1896 KU football team, Bert Kennedy, front row, third from left, is pictured with other members of that year's team. Bert Kennedy was the KU football coach whose 1909 team was the last to start a season 8-0 until the Jayhawks matched that record last Saturday. 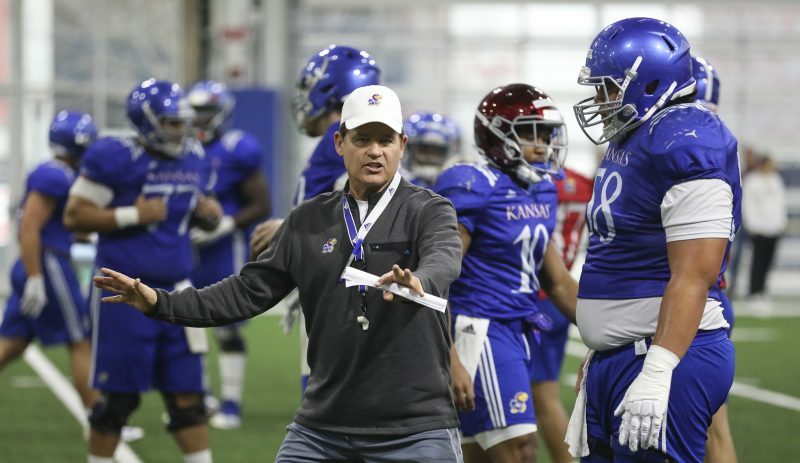 Ted Kennedy, son of former KU coach Bert Kennedy, talks Tuesday about his father, whose 1909 KU football squad was the last to start a season 8-0. 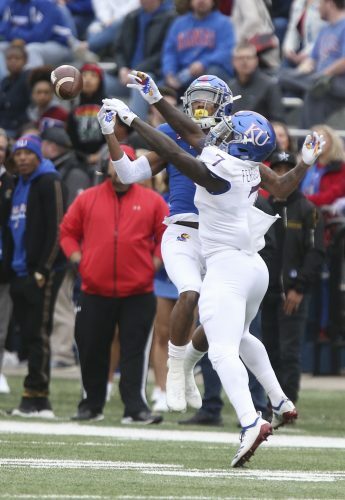 The Jayhawks matched that record Saturday in Texas and will go for 9-0 Saturday vs. Nebraska. Ted Kennedy is a former Lawrence dentist and mayor. Ted Kennedy, 95, answered the door of his Lawrence home, greeted his three visitors with a smile and welcomed them into his living room. “Oh, I hate that expression: ‘Still driving! '” Kennedy echoed one of his visitor’s patronizing statements. With those words, he taught his visitors a valuable lesson: Age is just a number. Kennedy is a modern man in every respect. He even takes daily learning journeys on his home computer. It will tell Kennedy more about his father’s football coaching career than his father himself told him. Kennedy’s father, A.R. “Bert” Kennedy, has worked his way back into the news because of the stunning success of this season’s Kansas football team. Bert Kennedy coached the Kansas University football team from 1904-1910 and had a career record of 52-9-4. He also played quarterback for Kansas (1895-97), after playing for Lawrence High. Kennedy’s 1909 team was the last one to go 8-0 before Mark Mangino’s team matched the feat Saturday in College Station, Texas. 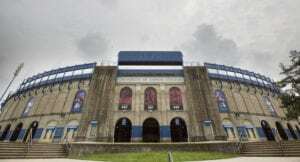 If Kansas can defeat Nebraska on Saturday in Memorial Stadium, the football team will have a 9-0 record for the first time since Kennedy’s 1908 team finished the season 9-0. After playing three years for Kansas, Bert Kennedy played his final year for the University of Pennsylvania and put himself through the final year of school by working as a sports stringer for the Philadelphia Bulletin, Ted said. In 1902, Bert formed one of the first professional teams. After that, he was credited with developing the single-wing formation while coaching at Washburn University, according to several reports his son has read via Google. He also coached at Haskell Indian Nations University. He practiced dentistry, and so did Ted. One of Ted’s three sons also is a dentist. Ted’s late brother, J.K. “Bud” Kennedy, inherited his father’s passion for sports, though their tastes differed. Bud Kennedy was the second men’s basketball coach at Florida State and held the position from the 1948-49 season through the 1965-66 season. Bud Kennedy was credited as an innovative thinker, employing a figure-eight weave offense. The family’s athletic ties don’t end there. Ted will be rooting for more than just the Kansas football team to score a victory this weekend. He also has a rooting interest in the Free State football team, which plays Olathe South on Friday night at Haskell Stadium. Jason Sneegas, a defensive back/receiver for the Firebirds, is the great-great grandson of Bert Kennedy. Ted Kennedy didn’t have enough passion for sports to consider coaching the way his brother and father did. His passions were dentistry and politics. 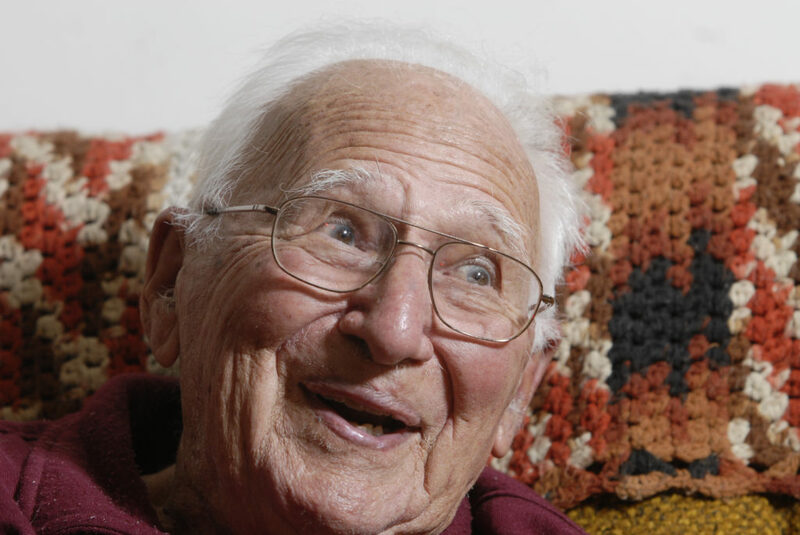 A dentist in World War II, Kennedy was in Japan and saw the surrender “through binoculars,” and then started a three-week journey home, coming to shore in California. Time heals all wounds. He’ll get over it eventually. Aside from practicing dentistry in Lawrence, Kennedy served two stints as mayor. 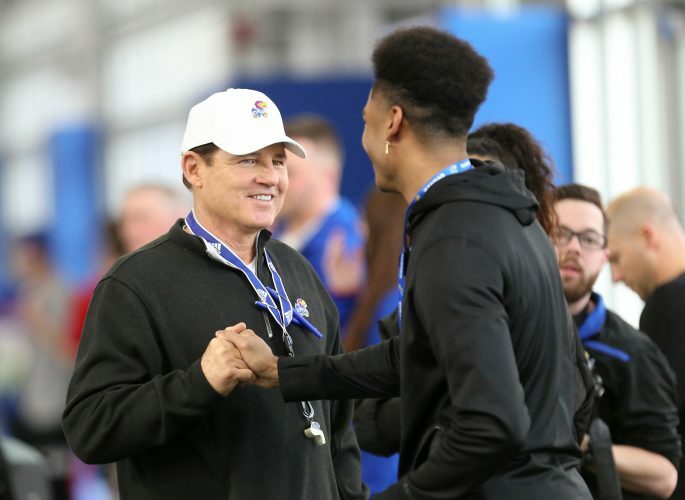 During the life of Clinton Lake, KU never has had a football coach with a winning record, though Mangino (33-35 in five-plus seasons) can move one game closer to .500 with a victory Saturday. During all but the most recent week of Ted Kennedy’s life – “I was born Oct. 12, 1912 at 117 S. Park in Lawrence, KS., Dr. H.L. 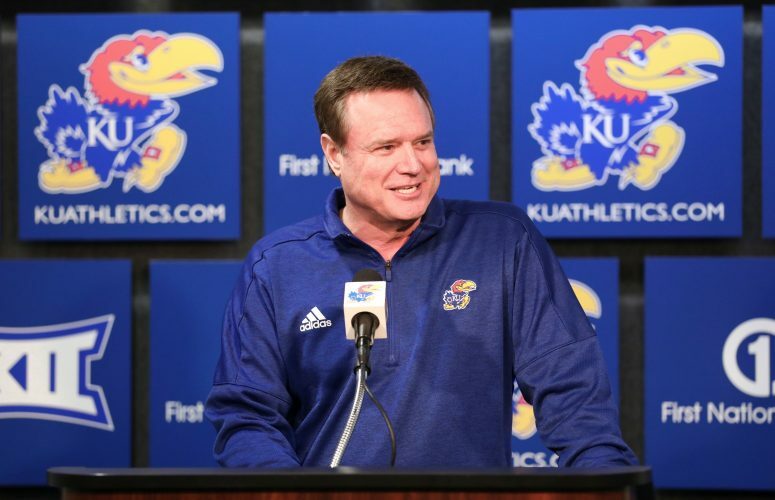 Chambers was the attending physician,” – KU never had a football team match the 8-0 start of his father’s 1909 team.